The magazine Gente Vieja, as the title might suggest, took pride in being a platform for an older generation of writers, at a time when a new wave of modernist literary and artistic styles, associated with the younger generation, were very much in vogue. Far from trying to compete with these younger writers, the contributors to Gente Vieja made a feature of their seniority, with the first issue proudly stating the age of the writer alongside their name. Of the 58 writers who are both listed alongside their ages in the first issue (10th December 1900), and who subsequently feature in the magazine, the average age of the Gente Vieja writer at the beginning of the project was 60.7 years of age, an age which would of course only increase as the years rolled on until the magazine’s final issue of the 25th October 1905. The writers were solidly bourgeois and male (only 3% of the named writers found were female, and being occasional writers, the overall space that their writing took up was proportionally much smaller), so we can may confidently say, given the magazine’s content, that this magazine was written principally by men and for men. However, this analysis is not of the magazine’s literary content, but of the advertisements which were printed in the magazine over its five years of life. 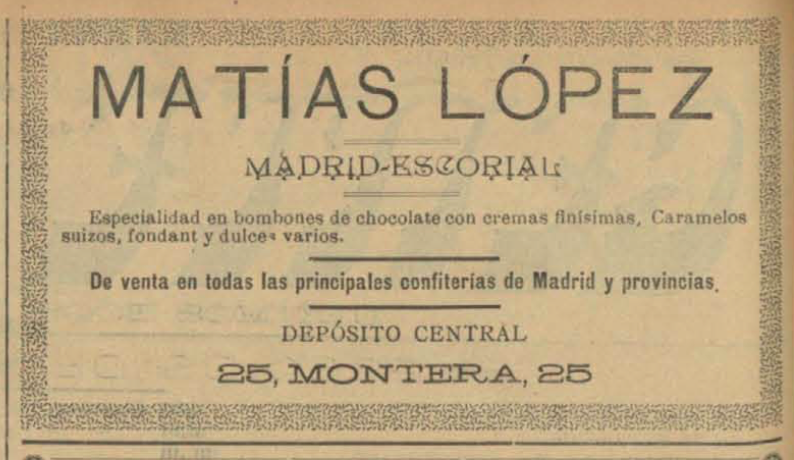 Magazine advertisements are regularly overlooked as a feature of periodical studies, but I would like to show that in some case, a magazine’s advertisements can shine an intriguing light onto life at the time, in this case, of turn-of-the-20th-century Madrid. In fact, such was the amount of data that I have found worthy of comment that it was quite an effort to decide what to prioritise. 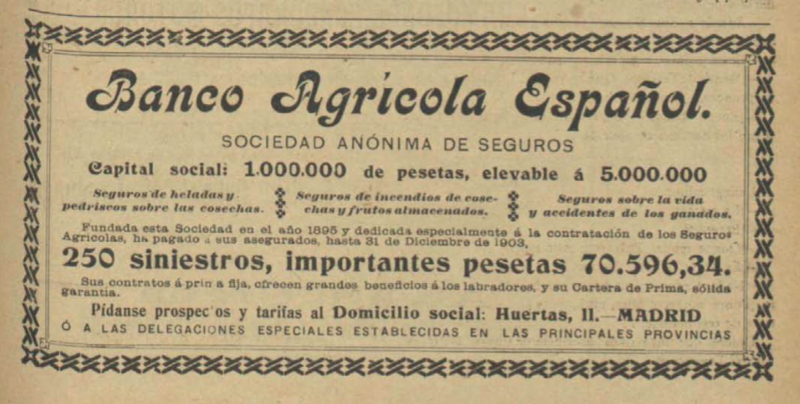 The magazine of Gente Vieja is a particularly rich source for analysis: from a total of 143 issues (issues 142 and 143 were rolled together into one double magazine), 3879 principle advertisements have been found. These 3879 advertisements were found to be for 172 different companies, showing that there was a large amount of repeat advertising within the magazine. On average, each company re-advertised 22.5 times over the life of the magazine, although in reality this average masks a wide variance in between companies. Most probably for technical and economic convenience, the repeated advertisements were often (but not always) exact calques in design, information and size of what had come before. There could be large adverts, some taking up whole pages, but in general adverts were printed in the business card size and format, with others being placed sideways, especially around the margins to optimize the use of space. In terms of location within the magazine, advertisements were placed at the bottom of the first page of the magazine, the whole second page of the magazine, and the last four pages at the end of the magazine, and tended to be clearly delineated as a discrete section, although in a few cases there were instances of advertisements creeping onto the last page of content, but without the graphical elements that would indicate to the reader’s first glance that they were advertisements. There were even 25 occasions on which advertisements were disguised as legitimate magazine articles, as what magazines now euphemistically deem ‘promoted content’. As has been stated, the science behind advertising is clearly quite new at this point in history, not least in Spain, with advertisements typical containing few pictorial elements, few trademarks, and some companies not even considering to provide a company name by way of an identifying mark (they merely provide an address where certain goods/services can be procured). 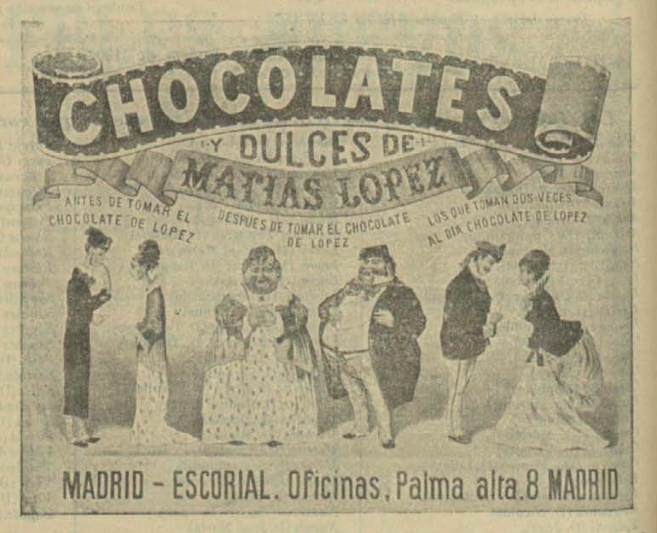 In my opinion the most eye-catching advertisements, in terms of artistry, come from Muñoz, milliners and Matías López, chocolatiers. Muñoz, who clearly understand the need to stand out from the other signs on the page, make the most of their business card format limitations from the beginning, and the subsequent change is likely inspired by the fact that the reader does not have to turn the magazine to read the new design. Please note that the advertisements displayed here are not represented in their true size, either absolutely or relatively to each other, because they have re-sized them for optimum clarity which means that, given the preponderance of blurry newsprint and incredibly small fonts, most of the advertisements have been significantly magnified. To give a sense of the magnification to read these adverts easily, consider that most of the adverts which feature here are in the business card format, which took up a tenth of the page (the page being 410mm x 280mm, and after 97, even smaller at 300mm x 200mm). There are over six hundred adverts for banks, mutual societies, insurance companies, money changers, share offers and investment companies/stock brokers. What is particularly notable is that these companies are relatively small and specialized in comparison with the conglomerates of today – there is an insurance company for agricultors, a bank for mortgage lending, companies for life insurance, a mutual society for retired military etc. In addition, all of these companies are keen to demonstrate their financial solvency by stating their total capital and other financial information within the advertisements themselves, to reassure potential customers. There is very much the sense that, unlike in our current age, none of these financial institutions are ‘too big to fail’ because they could not afford to be. 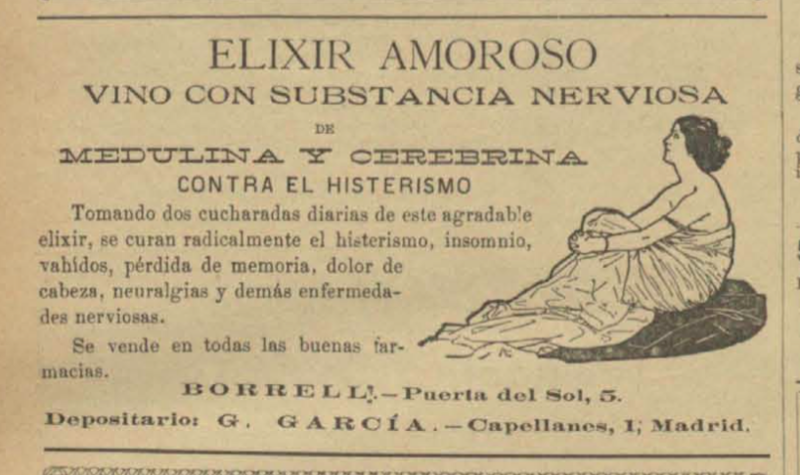 There are over 350 advertisements for various health ‘elixirs’, ‘tonics’ and pills, said to treat all manner of nervous, degenerative and consumptive illnesses, in keeping with the type of miraculous nostrums on sale in elsewhere in fin-de-siècle Europe. Reading between the lines some of these 'medicines' may have been used as aphrodisiacs, as can be seen from the suggestive wording in many advertisements. The fact that the vast majority of the readership would be expected to be ageing males (with similarly ageing wives) make the elixirs for ‘invigoration’ and ‘rejuvenation’ more understandable. 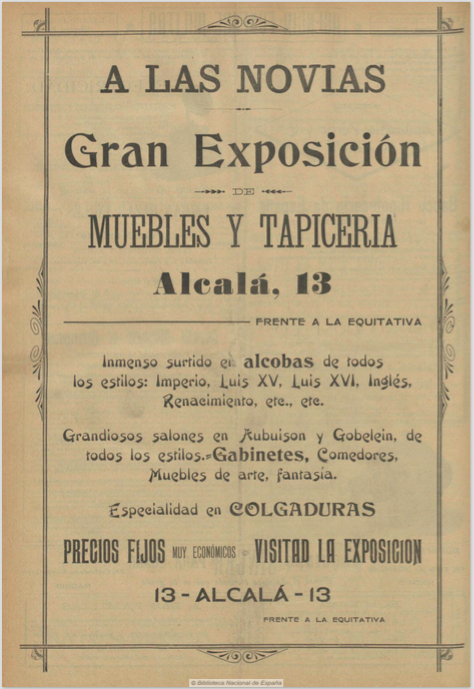 Unlike today, in none of the 370 advertisements for alcohol dealers or distillers is there any warning about the dangers of mis- or over-consumption, making it clear that the individual was expected to understand, through the historical cultural consensus, the appropriate role of alcohol in Spanish life and health. As with Victorian England the role of alcohol in health/medicine of entresiglos Spain was much more ambiguous than it is today. Traces of Spain’s colonial past can also be seen in some brand-names. 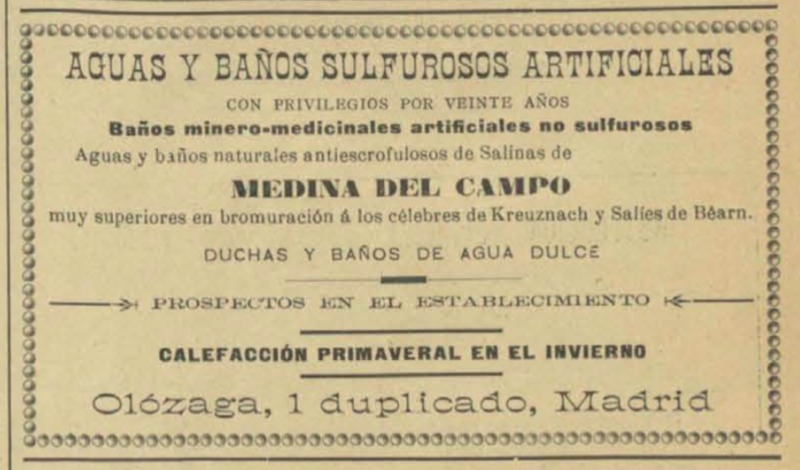 As was common for the epoch across the whole of the West, the medicinal use of mineralized, particularly sulphurous waters (aguas azoadas) was very popular. Unsurprisingly therefore there are over a hundred adverts for a total of twelve water-based companies offering spa resorts out of town, hydrotherapy centres within Madrid itself and, for the tightest budgets, bottled health waters to drink (Carabaña, one peseta per bottle). Natural salts from these waters were also sold as bath salts and soaps (‘Sales Naturales de La Toja’). Such was the popularity of hydrotherapy (swimming pools, saunas, etc), that there were often several advertisements for different companies within the same issue. There are almost 100 advertisements for private vocational academies of all types, offering various courses and exams in fields such as foreign languages, law, construction, architecture, civil engineering, mechanical engineering and electrical engineering. 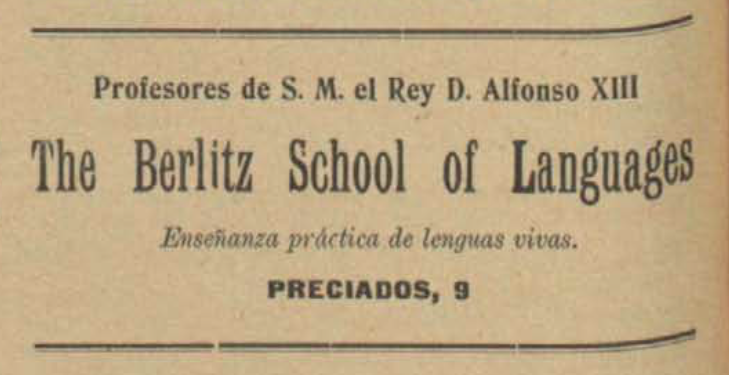 The Academia de Mazas advertises particularly heavily in the last six months of the magazine, often placing large adverts at both the beginning and end of the magazine, and uniquely (in issue 135) paying for a four-page supplement within the body of the magazine to promote its services. 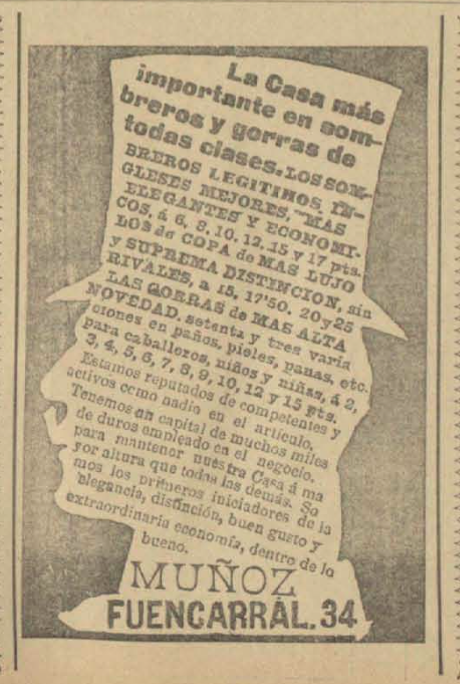 While at first glance it may appear counterintuitive to advertise in a magazine which was marketed to writers/readers of retirement age, advertising in Gente Vieja may have in fact been a shrewd move, as the readers may well have been the fathers of their potential clients, and therefore wield a heavy influence (not least in terms of purse-strings) on their sons’ career choices. What is fascinating about the jewellery advertisements is that although there are 69 advertisements which would fall into this category, only 6 are for a genuine fine jewellery company, and 7 for a watch company (Alejo Sánchez y C.a and Carlos Goppel, respectively). Far more common are advertisements for costume jewellery. 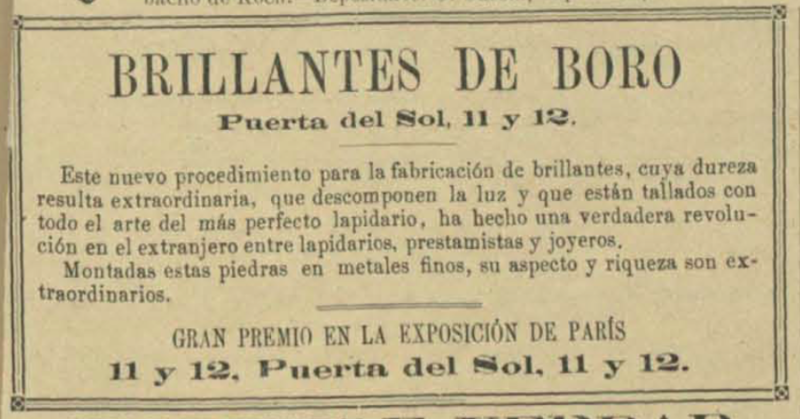 Brilliantes de Boro, which replicate gemstones ‘que descomponen la luz y que están tallados con todo el arte del más perfecto lapidario’ advertise a total of 43 times in the magazine, while the ‘marvellous invention’ of the Perlas Nakioquímicas, in which pearls are artificially created, are advertised 13 times. The preponderance of advertisements for what are effectively fake gems could suggest that many middle-class families’ economic position had diminished, or did not match social aspirations, but they were still incredibly keen to ‘keep up appearances’. 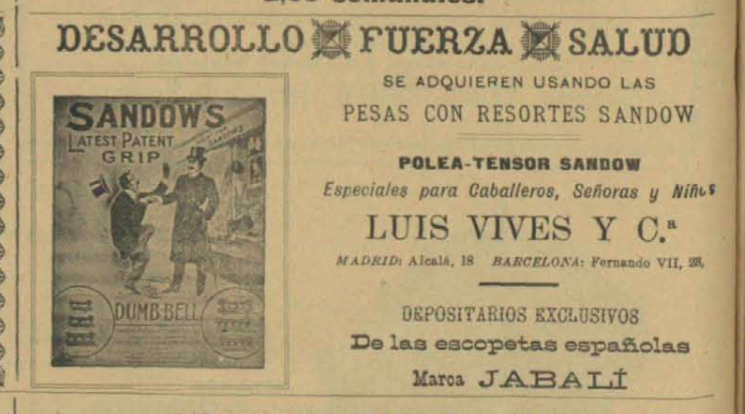 Ironically for a magazine subtitled ‘Últimos ecos del siglo XIX’, advertisements for new 20th century technologies feature prominently in the magazine. 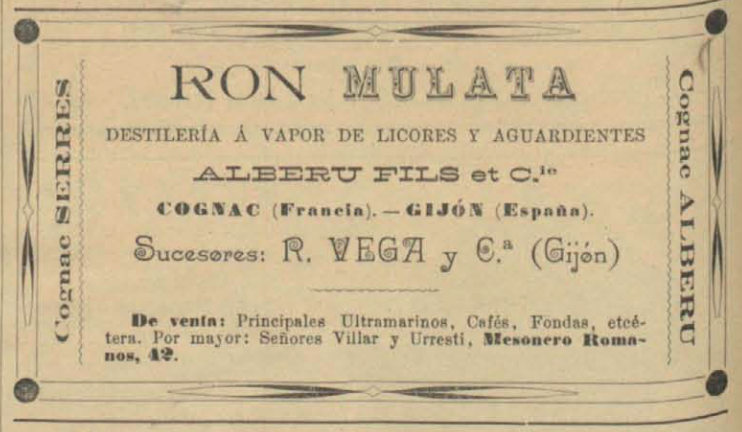 There is a total of 250 adverts for electric lighting, fittings and new-fangled electronic or clockwork gadgets for telephony, recorded music (‘Gramófonos y Zonófonos’), and even cinematography (‘películas y linternas’). 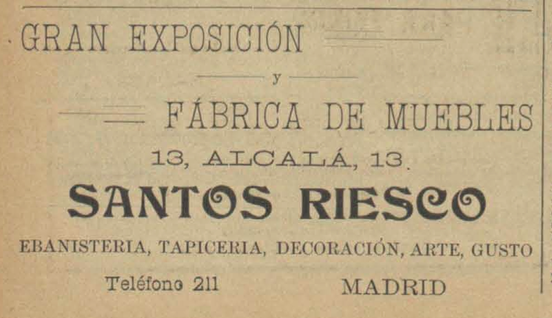 Advertisements themselves make clear that the telephone network is established in Madrid by 1901, with a few advertisers being able to offer clients the facility to call directly (Santo Riesco: 211, La Hurí: 241, Bodega Montalbán: 890 and Agencia Funébre Militar: 2.067) the complexity of the telephone numbers giving an idea of the development of the telephone network in that year. 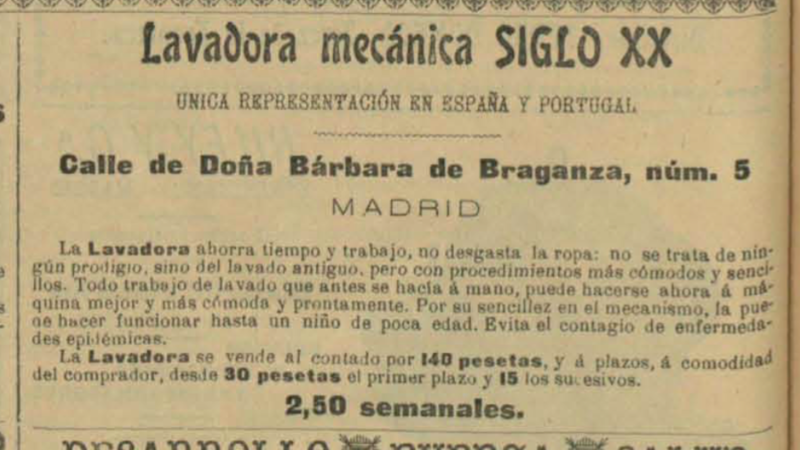 A few advertisements give a real insight into the technological innovations at that exact time including one advertising campaign (over September-October 1901) which announces the first working example of a washing machine on the Iberian Peninsula. 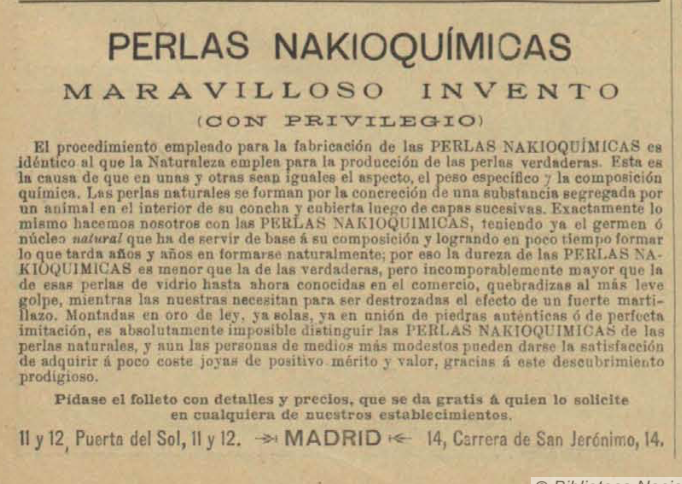 At 140 pesetas, it would be prohibitively expensive for most people, especially for the middle-classes considering the purchase of synthetic pearls and gemstones, but luckily for these groups, there was a rental option (with eventual ownership) for 2.50 pesetas per week. 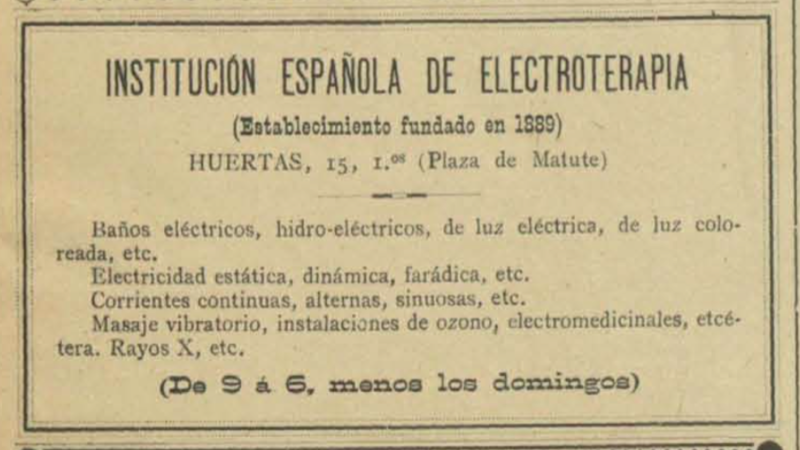 Such is the enthusiasm to put this new form of energy to every possible use, that it will come as no surprise that electricity was used for therapeutic purposes, with the Institución Española de Electroterapia (founded 1889) offering such therapies as ‘baños eléctricos’, dynamic currents and X-rays for a wide variety of ailments. The Galvani electric belt meanwhile promises a radical cure for health issues such as impotencia, exhaustion, premature ageing, neurasthenia, gout, etc, handy for if the tonics advertised in the same issues did not live up to their promise. However, electricity has clearly not won the day in every Spanish home, with the memorably named company ‘Despacho de carbones’ offering home delivery services on coals, coke and anthracite. 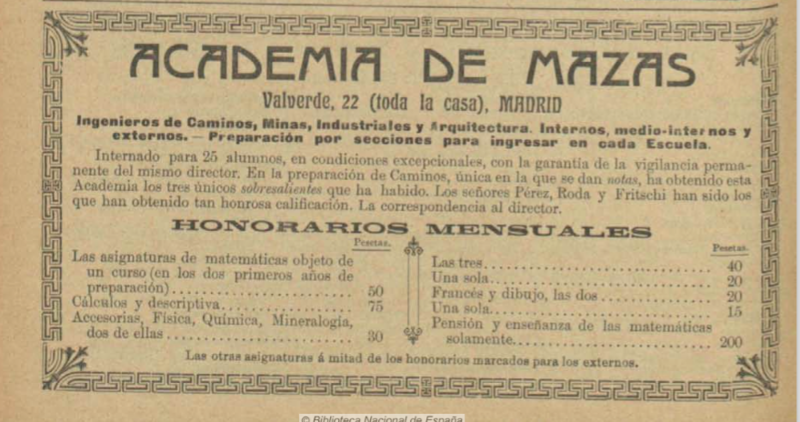 Quite unusually by today’s standards for literary magazines, but perhaps not when one considers that this was aimed at an older male bourgeois audience, there were almost three hundred advertisements (279) for engineering products, mechanical services and heavy industry. 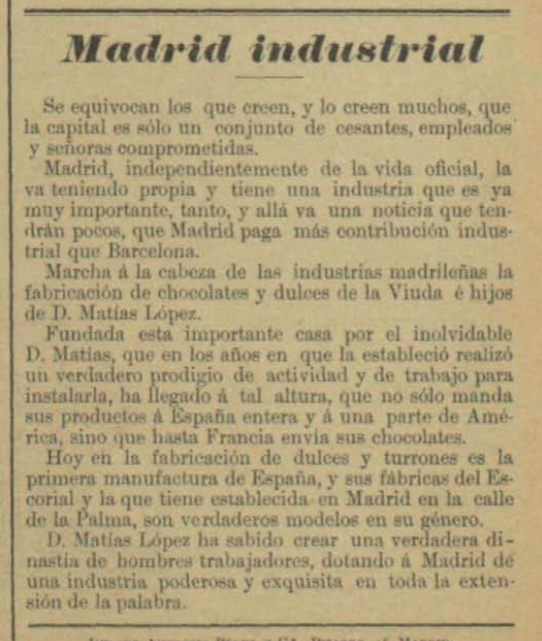 A metalworks factory (Altos Hornos de Vizcaya) lists the products that it can manufacture, advising that interested parties can contact by letter for further information, as does a container factory in Guipúzcoa (Sociedad Franco-Española de Envases Cilíndricos) and a fertilizer/chemical factory with various sites in Vizcaya and Asturias (Sociedad General de Industria y Comercio). 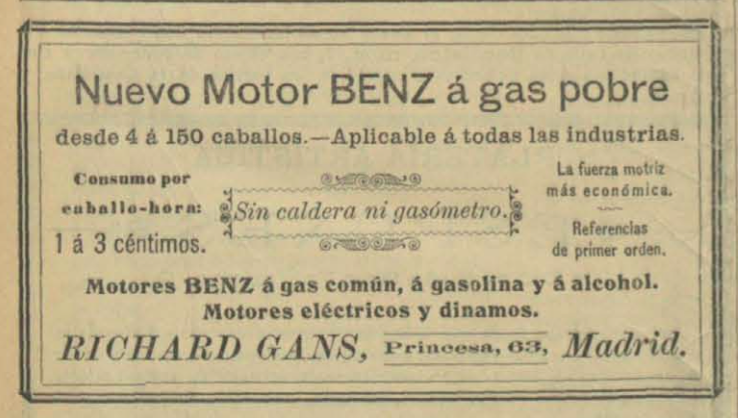 Ingenieros de Madrid Riley y C.a run over a hundred advertisements for turbines and other machine/electrical parts, José Battle y Hernández advertises steam, electric and petrol automobiles while a one-off advert can be found for Motor BENZ engines. However, not all uses of petrol were put to such good use as the newly-fangled combustion engine. 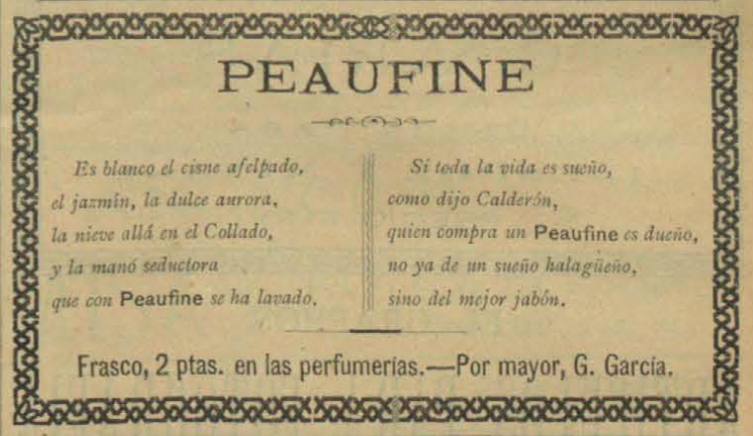 Early on in the life of the magazine, petrol was advertised prominently as a hair care product, with Petróleo Gal running quarter-page adverts from the first issue until issue 18. Perhaps more worryingly, petrol was also being used in huge 5- and 18-litre tins for what appeared to be indoor heating purposes (Arévalo). Thankfully, these Arévalo adverts end by issue 35, leading one to hope that technology in heating had moved on to safer alternatives. 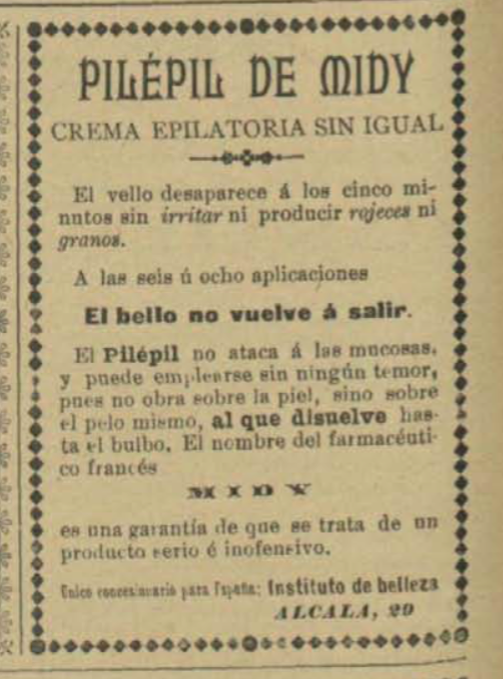 At the beginning of 1905, over nine issues, the same uninspiringly-named beauty salon advertises the French ‘Pilépil de Midy: Crema Epilatoria sin Igual’, going into great detail about the actions and features of this cream, and advising the reader that they are the only concessionary in Spain for this Midy product. Note also the lack of final proof-reading for spelling. Perhaps the recipe for this miracle product has been lost in the mists of time, as this cream promises permanent hair removal after 6-8 applications, a feat which has not been replicated in pharmaceutical beauty science since! 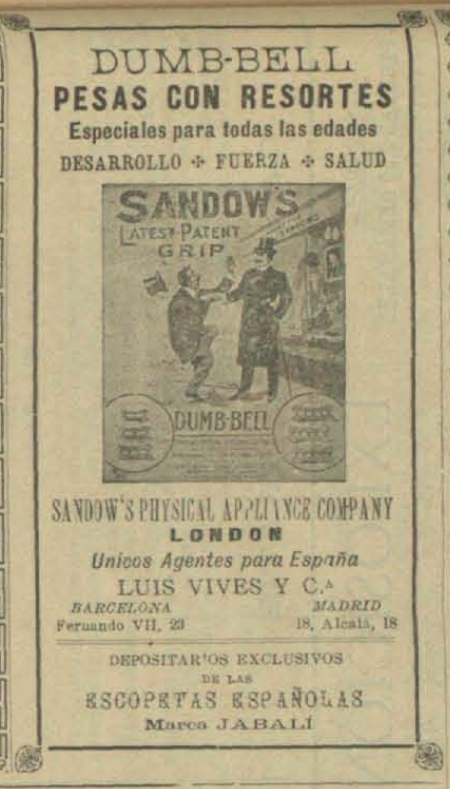 In a similar vein of exclusivity, Luis Vive y C.a runs a total of 42 adverts in the first year of magazine for Sandow’s Physical Appliance Company Dumb-Bells (London), for whom they are also the only distributor in Spain. What is particularly interesting about this advert is that for the first eight issues of the magazine, its business card format saw the information printed sideways, and evidently at some point the advertisers realized that this was not the best way to market the product. From issue 9 the advertisement changed to right-side-up, making it more likely to be read by the casual reader, but the bigger, more eye-catching font necessitating a sacrifice of information about the actual product itself. Further evidence that women would be expected to peruse the advertisement section of the magazine is that all types of clothing and fabric shops are advertised. Most of the advertisements in this category do something to remind us in some subtle way that we are reading a magazine at the turn of the twentieth century, whether this be for hats or shoes, while some products simply do not exist as everyday products anymore (for example, there are 31 adverts for corset companies). 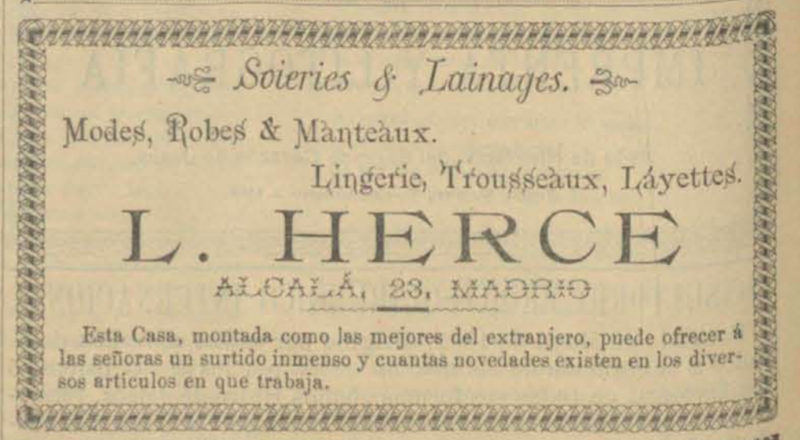 The linen store Ruíz de Velasco y Martínez, also sells bridal trousseaux (‘EQUIPOS PARA NOVIAS – PRECIOS FIJOS’), while L. Herce takes a much more subtle approach, using a ornate seriffed font and French words to describe its products (which include trousseaux), in order to appeal to fashion- and status-conscious women, who are clearly its principle customers. As a reflection of how different things were from today, when we tend to buy ready-made, mass-produced and relatively simple/utilitarian clothing, there are over 50 advertisements for fabric/textile shops, 85 advertisements for various tailoring services (with Antonio Urosa specializing in capes), and 113 advertisements for the Singer sewing machine, which, like the new washing machine, can be yours for 2.50 pesetas per week. Also, like the washing machine, the Singer sewing machine was a foreign import (Concesionarios en España: Adcock y C.a) and one might almost fancy that it was Unamuno reading the back pages of this magazine that caused him to formulate the idea of ‘¡Que inventen ellos!’ a year after the magazine folded. Another common aspect of these advertisements is that merchants often advertise exhibitions and open days as a way for people to browse their products and ask questions. Because many these exhibitions tended to be for products which would be used by women, it is tempting to hypothesise that the ‘galería’ was an opportunity for the merchant to be able to harness middle-class female acquisitiveness by turning his business into an associative space, a social meeting-point, for the burgeoning consumerist classes. 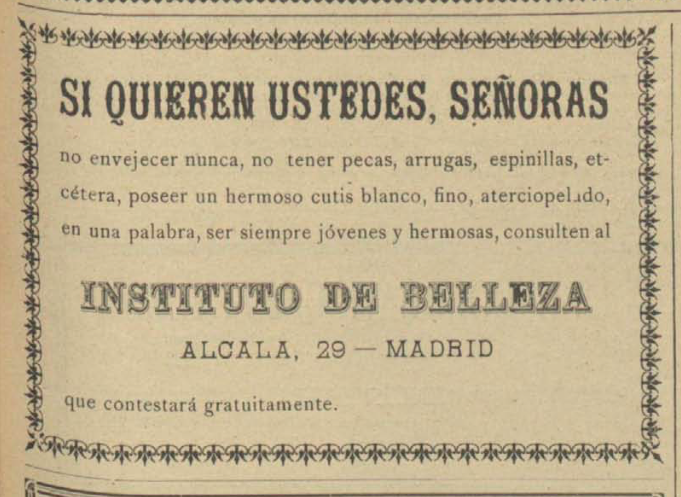 This hypothesis is strengthened by the full-page advertisement for the full-page advertisement for the exhibition at c/Alcala, 13 (pictured), which specifically targets young women desirous to set up a beautiful new family home. 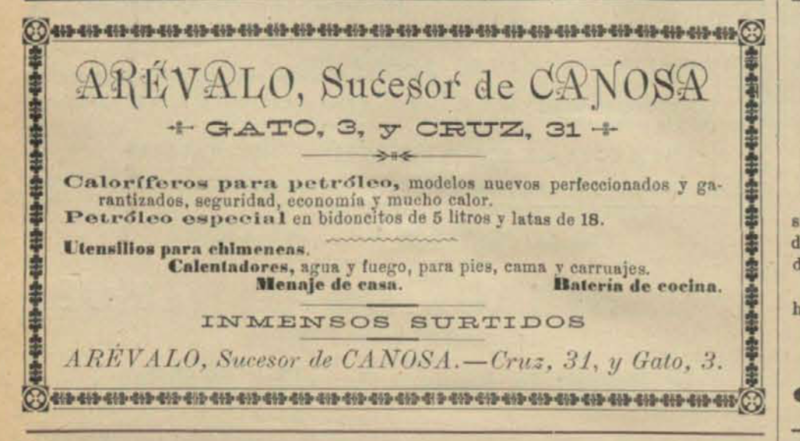 Finally, as might be especially expected for a magazine entitled Gente Vieja, there are a total of 25 advertisements for various funeral services, including funeral lights. There is the risk of reading too much into the presence of funeral services in a magazine for older gentlemen, especially given the reality of the much higher mortality rate among all age groups around 1900. However, given that the magazine features 47 obituaries over its five-year life, and most of these obituaries are for former mozos viejos of the redaction, including eventually its founder and editor, perhaps these particular advertisers had identified their target market well. 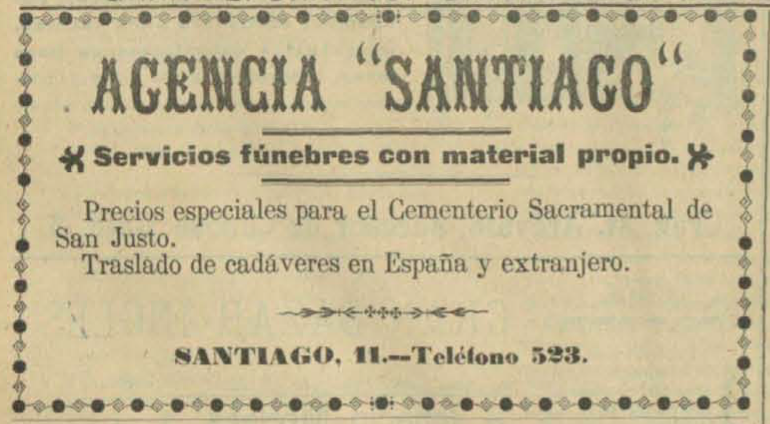 What is particularly worthy of note in the advertisement for Agencia "Santiago" (below) is not the inclusion of inverted commas around the brandname (which suggests an uncertainty in how to deal with brandnames in writing), but the fact that the agency highlights their service of bringing the dead home from abroad, a reminder that while Spain may have lost the last of its significant colonies only a couple of years previously (this advert ran for a short series in 1901), Spain was still very much a transatlantic nation, in the sense that it could still count on a large diaspora living overseas at any given point. 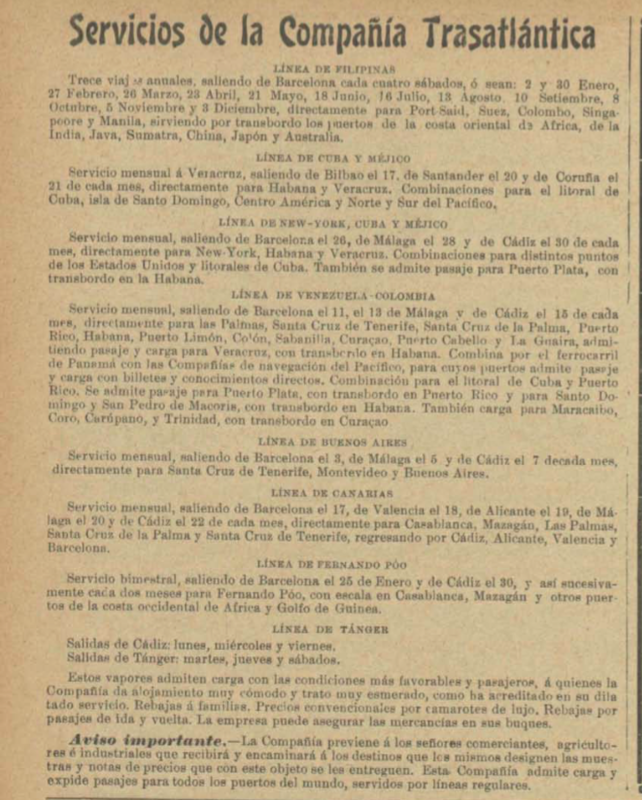 The ubiquity of advertisements for the Servicios de la Compañía Transatlántica (so ubiquitous, that there are only 3 issues in which it does not feature), which lists all of its global steamship routes, destinations, and departure dates, also attests to this fact. Using the steamship, Spaniards could travel to any continent of the world. While advertisements have the tendency to be seen as worthless paratextual elements to periodical researchers (and even digitisers), an attitude which can be traced back to the contemporaneous readers, who often removed the advertisement pages when binding the loose magazines into tomes, I hope to have shown that magazine advertisements can really help the modern researcher to situate the other elements within the magazine within their original cultural and historical context. When I first undertook this analysis, I did not expect to glean more than a few paragraphs of anecdotal interest from this topic and I certainly did not expect to find so much worthy of comment in the detail. I hope my analysis will persuade other researchers to consider looking at the advertisement sections of magazines with more care, because the materiality of the magazine matters, and as such, advertisements merit at least some of the same critical attention that other elements of the magazine receive. This percentage is based on the count of 403 male names/male pseudonyms, against a count of 13 female names. I have used the word ‘principle’ because occasionally advertisements could be found within advertisements, blurring the nature of what could be constituted a single advertisement. 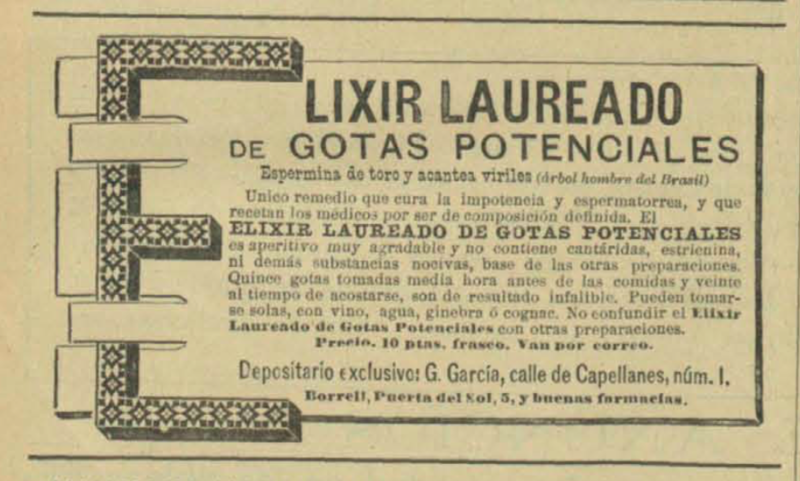 Washing with water was not the only solution to cleaning clothes, however, with Tinte Lyonés running 11 adverts between April and September 1904 for drycleaning and professional dyeing services. 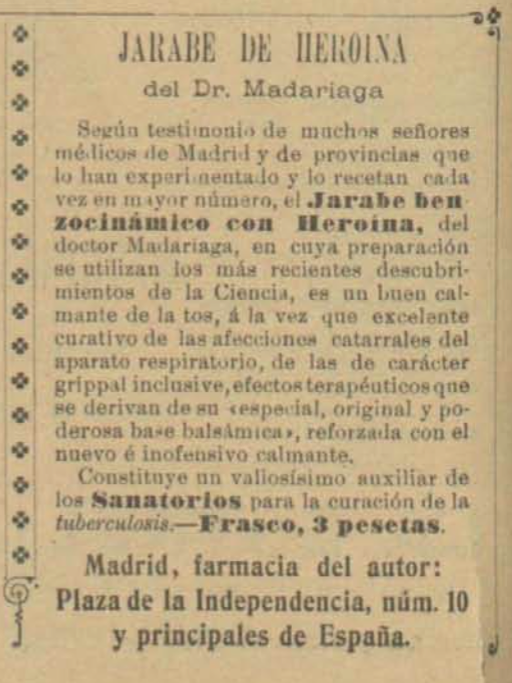 Indeed, L. Herce’s calculated desire to build up an exclusive and admired brand in the minds of women can be seen in the ‘promoted content’ featured in the 14/12/1905 issue of El Álbum Ibero-Americano, written by its editor Concepción Gimeno de Fláquer. Entitled ‘La mujer en la industria’, the article is ostensibly about ethical companies which offer seamstresses good pay and conditions, and it happens to feature L. Herce as its showcase example of a good employer. In case there was any doubt about this being promoted content, the article ends with the casual mention that the company is sewing the trousseau for the royal infanta María Teresa. Advertisement is quite a big focus in periodical research particulary in the context of DH-projects like Europeana and SIAMESE. 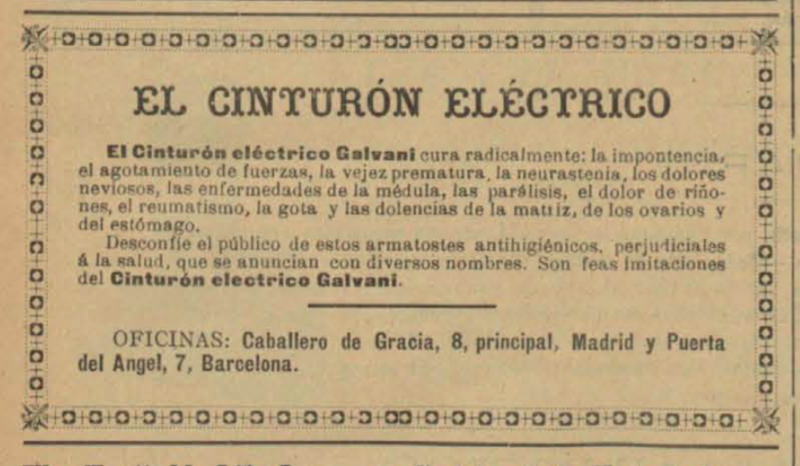 And the advertisement "El cinturón eléctrico" refers again to Arte Joven (1901): The very same "cinturón eléctrico" was the heritage of Francisco Asis Soler who tried to get his magazine Arte Joven financed by the income out of the strange electric therapy. 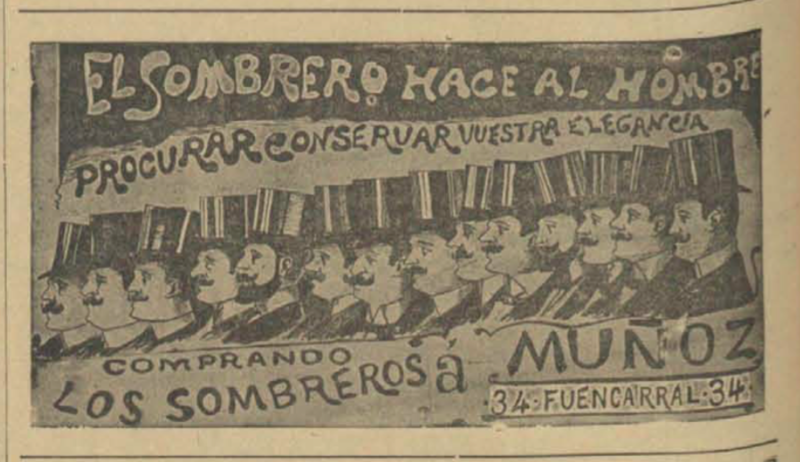 Yes, I was aware about Francisco de Asís Soler's connection to the cinturón eléctrico, because the following was reported by Francisco J. Flores Arroyuelo on page 24 of his article 'ARTE JOVEN: 1901, una revista modernista' (Monteagudo, 3a. Época - No 7, 2002, p.24 "Y junto a todo ello, el hecho de aportar con él el soporte económico de la aventura que iban a impulsar como era poner en circulación una revista literaria de título Arte joven, pues no en vano lo hacía también como delegado encargado de promocionar en Madrid el invento familiar de un cinturón abdominal eléctrico, artilugio capaz, según la propaganda, de producir efectos casi milagrosos a la hora de hacer frente a problemas intestinales y hasta de impotencia, y que por lo visto ya había reportado a la familia Soler unos saneados beneficios." However, I didn't mention him here because he was never wrote for Gente Vieja nor appeared to be part of their circle (which is unsurprising, as they called themselves the mozos viejos​), so there was no evidence to suggest that the relationship his family's company had to the magazine was anything different to that of other advertisers, i.e. purely commercial. However, I was not aware that advertisements were a big focus in periodical research elsewhere. I am certainly glad that they are getting the attention that they deserve. and please feel free to link to any research you feel may be of particular interest to readers of this blog.